The hamlet of Ord is breathtakingly beautiful and secluded: a few houses, four miles from a two way road and seven from the nearest pub and shop. Just a beautiful safe shore with abundant wildlife and one of the best views in the UK. 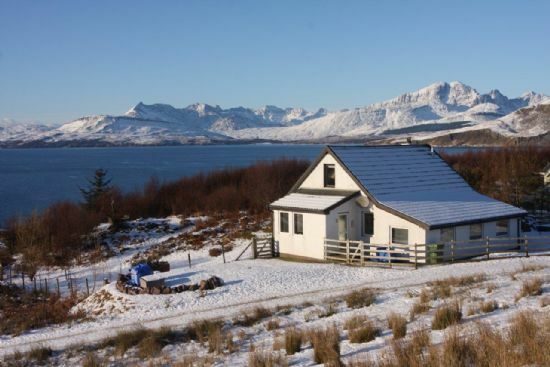 From our holiday house you can see over Loch Eishort to both the Cuillin of Skye and the Cuillin of Rum, Scotland's most famous and rugged mountains- a truly wonderful view, both summer and winter. Ord is in the south of the Isle of Skye, which is arguably Scotland's most beautiful Island. Skye is on the north west coast of Scotland, part of the group of islands called the Inner Hebrides. 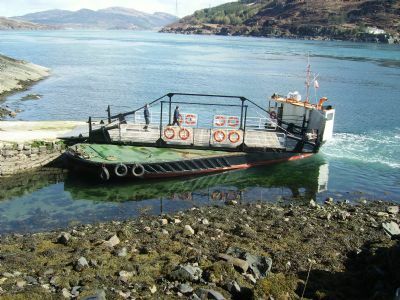 The other Hebrides include Barra, Uist, Harris and Lewis all of which can be accessed by ferry. Skye is famous for its variety of beautiful scenery both mountain and coastal. It has fabulous walking. It is also steeped in Scottish history e.g. Dunvegan Castle, the Clan Donald Centre and the grave of Flora MacDonald who rowed the defeated Bonnie Prince Charlie "over the sea to Skye". It also has great food and drink; famous restaurants such as the Three Chimneys and the Kinloch Lodge, home to the classic malt whisky Talisker and to the Skye Brewery. Ord is near Armadale and Isle Ornsay on the Sleat peninsula in the area known as the garden of Skye. This area also houses Sabhal Mòr Ostaig, the Gaelic college, internationally recognised as a National Centre for Gaelic language and culture. Ord is about 15 miles from Broadford and 42 miles from Portree. Our holiday house is a rebuilt and upgraded Swedish Chalet. The interior has a large open plan sitting/dining/kitchen area. This room runs along the whole length of the house, there is a large external deck and there is a mezzanine sitting/ play area. The house is well insulated and has modern double glazing. We have a log burning stove (wood is supplied free of charge) backed up by electric storage heating. The house has a landline payphone, which allows guests to recieve calls free and has WiFi broadband. However this is a rural area and the broadband speeds are slow, to slow to stream video. At the moment the house and hamlet of Ord do not get a mobile phone signal on any network, if you walk a few hundred meters uphill you can get an intermittent phone signal. The holiday house sleeps six in three bedrooms, a double and two twins. We normally allow one dog, sometimes two, but prefer to discuss specifics of pets with our guests individually.